Two more previously unseen photographs of 1/24 Marines were kindly sent in by their families in the past few weeks. Photo submitted by Pamela (Santerre) Sloope, daughter of Robert Santerre. Robert Ulderic Santerre, born September 9, 1925, and raised in Nashua, New Hampshire. Robert enlisted in February, 1943 at the age of seventeen. He spent the first months of his service as a guard at Naval Operating Base, Norfolk, Virginia, then was assigned to the 59th Replacement Draft headed for the Pacific. PFC Santerre was intended to be a replacement for a Second Marine Division casualty of the battle of Saipan, but on July 12, 1944 was attached to the Fourth Marine Division instead. 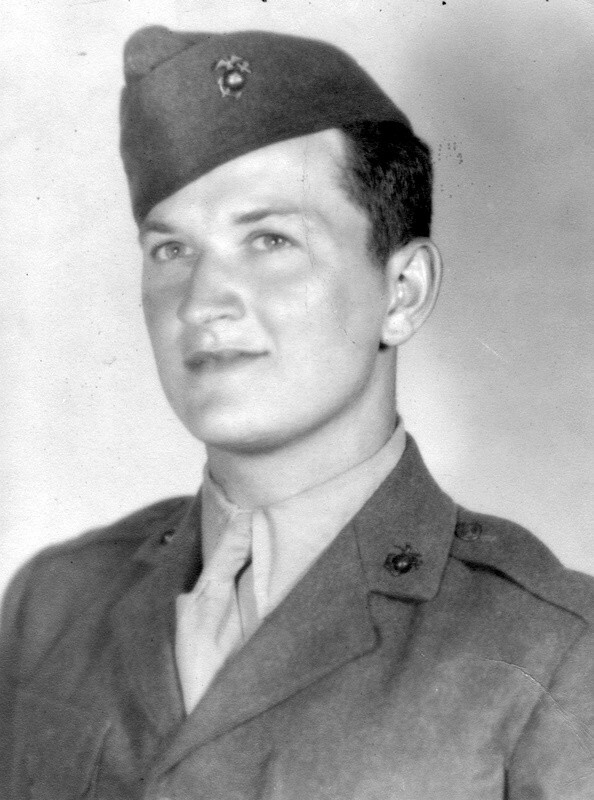 He joined Captain Irving Schechter’s veteran Company A, 1/24th Marines, and twelve days later made his first combat landing with them on the island of Tinian. Santerre was only on Tinian for a few hours; he was shot in the back during the great Japanese banzai attack early in the morning of July 25, 1944 and evacuated to a hospital ship. 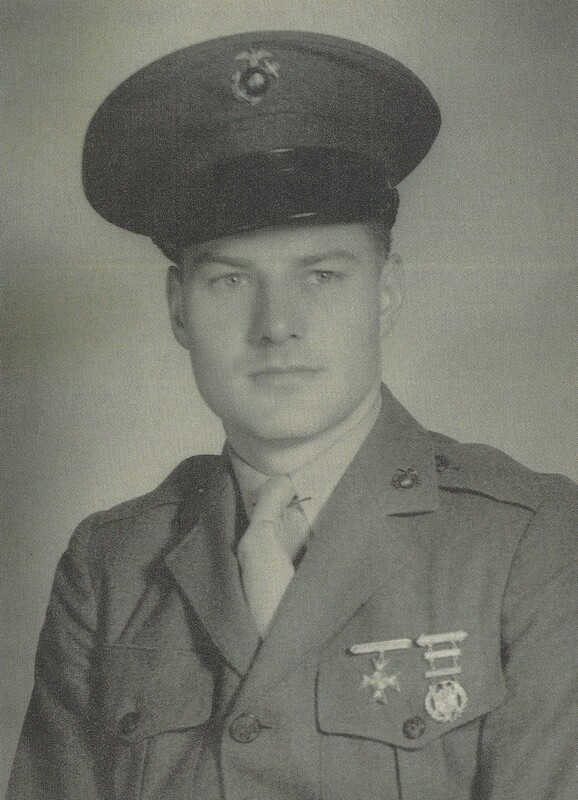 The company finished up the campaign without him, and as the surviving Second Marine Division replacements were released back to their original units, those in Able Company who’d gotten to know Santerre in the two weeks before his wounding probably reckoned they had seen the last of him. However, on October 17 1944, Santerre returned to the company. This was unusual in that few of the Second Division men stayed with 1/24, and the explanation probably lay in logistics; Santerre was hospitalized in Hawaii where the Fourth Division was in rest camp, and it was easier to send him there than to ship him to the Second Division’s home on Saipan. Santerre went on to fight in the battle of Iwo Jima, where he was wounded a second time – again, shot in the back, and in almost the same place as before. This was the end of his combat career. After a lengthy hospital stay, he was honorably discharged as a corporal in time for Christmas, 1945. After the war, Robert Santerre returned to Nashua, took up a career as a draftsman for General Electric, and started a family. On July 31, 1983, he was brutally attacked and murdered by two individuals who broke into his house and ambushed him in his bedroom. The Nashua Police Department opened the biggest investigation in their history, and finally tracked down the culprits. Pauline Choate (18) and Barry “Bubba” Brown (22) were arrested three months later in San Diego and charged with first degree murder, burglary, and robbery. Both were convicted and sentenced to 12 and 20-life prison terms, respectively. Santerre, gone before his time, is buried in Massachusetts National Cemetery. William Curtis Logan, born August 22, 1918 in Clay Center, Kansas. “Bill” Logan enlisted early in the war, on January 20, 1942, and swept through recruit training at MCRD San Diego. He excelled on the rifle range – note the Sharpshooter’s badge he wears – and immediately after graduation was permanently assigned to the range. Although only a private, Logan was quickly made a coach and through the end of 1943 stayed at the recruit depot, teaching boots how to shoot. He also earned two additional weapons qualifications, as evidenced by the decoration on his uniform. On February 21, 1944, PFC Logan was assigned to C/1/24th Marines as a machine gunner. He would fight through the battles of Saipan, Tinian, and Iwo Jima with Charlie Company, attaining the rank of corporal and command of his own machine gun squad by the time of his discharge. Always reluctant to talk about his experiences, he did share two close calls with his son, Brad. Happily, Bill Logan came home to Clay Center and lived a long and busy life. He passed away in 2009 at the age of ninety, and is buried in his home town.